When you watch a film synched up to RiffTrax, do you still picture the silhouettes of wisecracking ‘bots Tom Servo and Crow T. Robot in the little Satellite-of-Love screening room of your mind? And if not a smidgen of that question made sense to you, this post probably is one you can skip (unless you’re a completist, and have thus far read every Black Gate post to date. In which case, we should probably know who you are. Has anyone read every single BG blog all the way back to day one?). 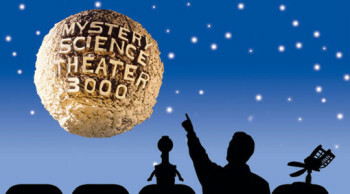 This report goes out to fellow Mystery Science Theater 3000 (MST3K) fans out there in the blogosphere. On July 9 of this year, on special assignment from BG’s Midwestern outpost in Minnesota, I attended a live screening of the RiffTrax presentation of Sharknado 2: The Next One. Two fan-buddies who share my adoration of Michael J. Nelson and his crew accompanied me on this outing (readers here will be familiar with one of those friends: none other than sometime BG scribe Gabe Dybing). In a bona fide movie theater we would share with other diehard fans an experience usually relegated to our laptops and living room televisions. Apparently, though, the MST3K/RiffTrax phenomenon does not have quite the dedicated following in Rochester, Minnesota that it does in other cities around North America. Ironic, given the proximity to the Twin Cities where MST3K was born. Next time we may go across the river to La Crosse, Wisconsin — I hear there is a more lively turnout for these events over there. The three of us made up about half the total audience. There were approximately 8 people who showed up for this special event, so we really could have held it in someone’s living room. But we got to be in a big dark movie theater with Surround Sound! and luxury tilt-back seats! and popcorn so exorbitantly priced you’d think the butter was liquid gold! and soda only slightly less expensive than high-end vintage wine (and a few free swigs from the flask that Gabe smuggled in)! For these live events, you’re mostly watching the film on screen with the commentary from Nelson, Kevin Murphy, and Bill Corbett coming from “offstage.” In a bit of introductory preamble, though, we saw the comedians standing onstage at their miked podiums in some theater down in Texas. Occasionally throughout the film a split-screen would also show them in tight close-up delivering their lines — a reminder for us, I guess, that this was happening live. I don’t know if the air conditioning had broken down in the theater they were at or what was going on, but all three men were sweating profusely. They did make reference to the stifling heat at the beginning of the show. The only thing that periodically seeing their faces did for me was to make me worry that one of them might collapse from heat stroke. Their banter, their jibes, their witticisms, their pop-cultural allusions — all of this was delivered as reliably as anyone who has followed them over the years would expect. The film itself — Sharknado 2, the made-for-cable piece of camp that is already self-parody — managed with its self-consciously over-the-top absurdity to generate some laughs on its own without any help of the RiffTrax crew. I’d seen it when it was first broadcast on the SyFy Channel. 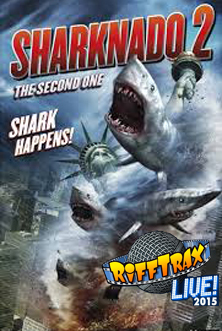 In short, the teaming of RiffTrax and the Sharknado franchise delivered exactly what I was expecting; no more, no less. One example of the pre-show stills provided for the RiffTrax Live experience. The real surprise gem of the evening, though, was the short 1970s film they dug up to start off the celebration of mockery-as-high-art: “Why Do I Need Parents?” This 10 minutes of celluloid — about a boy whose maniacal-looking puppet comes to life, turns him invisible, and teaches him a lesson about why he shouldn’t take all the hard work his parents do for granted — is so jaw-droppingly bizarro that, with very little editing, it could be turned into a cautionary film about the dangers of dropping acid. Such a subject obviously brought out the best in Mike, Kevin, and Bill, as they gave voice to our stunned observance and channeled all the inarticulate “WTF?” floating through our heads into coherent wit. After doing this for nearly three decades, they also know when to stay silent and let a cluelessly absurd scene inspire incredulous laughter all by itself. Not for long, though. Just when our laughter is dying down, they have a zinger ready to revive another bout of appreciative mirth. They have a rhythm that has been honed through hundreds of episodes of MST3K and hundreds of subsequent RiffTrax. Indeed, at the start of the show Kevin Murphy noted that they had marked a milestone. In the nine years that they have been doing RiffTrax, they just completed number 200, which now surpasses the number of films they skewered on MST3K (which ran from 1988 to 1999). Think about that. These guys have sat through around 400 films, engaging with the screen (as many of us are wont to do with less quick-witted reflexes) in a comical performance as jesters who stand in for us — only, as us if we really had a lot of time to pause and think of the perfect snide remark to make at the screen. The sort of clever jest that we might be lucky to deliver once in a month of television viewing, they toss out dozens of times throughout a single program. And now they’ve done this on about 400 occasions — and they’re still cranking out new tracks at an unrelenting pace. When you think about the body of comedic work they have amassed, it’s a bit staggering. 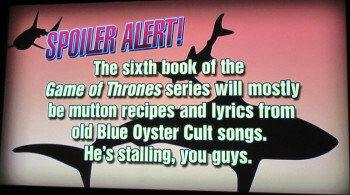 RiffTrax has really opened up their “schtick.” On MST3K they watched mostly cheesy, low-budget B movies. Oh, maybe there were half-a-dozen that could be classified as classics of their genre and era (such as This Island Earth, which they did for Mystery Science Theater: The Movie). 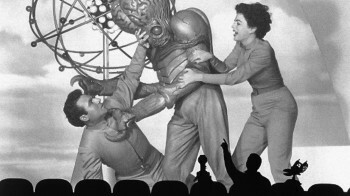 But one would be hard-pressed to find many Academy-Award nominees in the MST3K ouvre. RiffTrax threw the door wide open, though. Big blockbusters like the Harry Potter films, classics like The Wizard of Oz, Oscar winning films like Peter Jackson’s Return of the King: one can watch films both good and bad with an added layer of snark. My wife would hate it. She’s not a fan — she gets annoyed at me when I make a snide remark at a show she’s watching. Listening to those guys chatting throughout one of her films would probably drive her crazy. I love it. Love to hear the semi-improvisational stuff they come up with. Half the films they’ve done I wouldn’t have been able to sit through otherwise. I would never have gotten through any of those Twilight films without the aid of the RiffTrax crew. I’ve been watching MST3K almost back to when it first started airing, and am now beginning to delve in to the RiffTrax canon. Still, I’ve probably only indulged in less than a tenth of their catalogue. If I live to be eighty, I’ll be hard-pressed to get to all of it. When I’m 64, there will still be MST3K episodes or RiffTrax I haven’t yet enjoyed. And that, for me, is a very comforting thought. I wouldn’t mind having a RiffTrax of my life, commenting on my day-to-day activity, reminding me of how silly and absurd so much of it is. Next up for RiffTrax Live 2015: The Crappening will be Miami Connection, simulcast the evening of October 1 to (if you’re lucky) a theater near you! 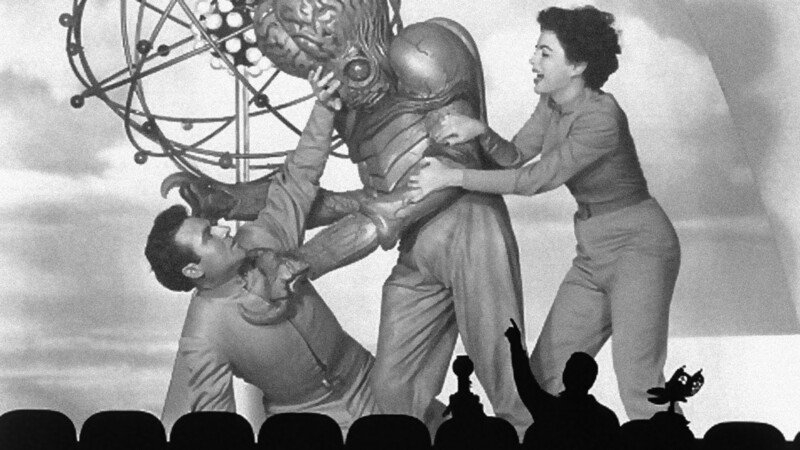 While not being much of a social media maven, I must say that I did enjoy Joel Hodgson reviving the Turkey Day Marathon and having a Twitter feed running alongside the movie so that we fans could toss in our snark, together with the high-grade sarcasm of the MST3K crew. Considering ours was not rehearsed, it was decently snarky.